Taken from gal-dem’s print issue. Buy it here. 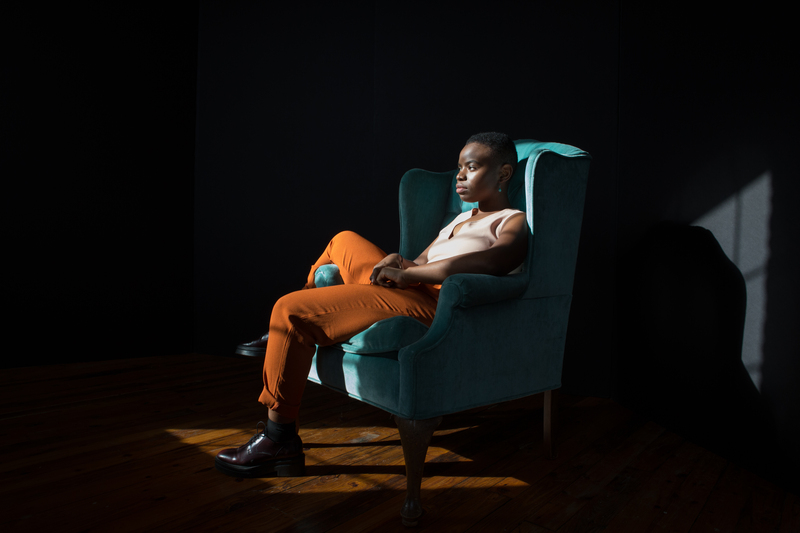 Meet Vagabon, the Brooklyn-based singer, producer and musician, who released her critically acclaimed album Infinite Worlds on Father/Daughter Records earlier this year. Fresh from a European tour with a sold out date in London and a spot supporting Tegan and Sara, there is no doubt that she is a force to be reckoned with. The brains, hands, and voice behind the project is Lætitia Tamko, a Cameroon-born New York-bred 24-year-old with the collected coolness of all your faves combined and a set of pipes to match. We introduce ourselves on a phone call across the Atlantic to discuss her music and her story before she embarks on her tour. With a speaking voice considerably more hushed than her singing voice, but equally pensive, Lætitia and I begin chatting about her work. She explains how her album “deals with the concept of home… what it is and what it looks like for [her]”. One of the most immediately noticeable features of Infinite Worlds is how personal it feels. It’s one of those albums where every song feels like an exclusive insight into the inner-workings of the mind of someone that you know and care about. A further part of its magic, however, is also that each song could quite easily encompass the thoughts of a different person entirely. “Some people may not think that an album can be cohesive with so many different textures and so many different genres… but I wanted to make an album in the same way that I like to listen to them,” says Laetitia. She details her thought process in structuring the album and it strikes me as a refreshingly holistic approach to take to songwriting. Instead of compiling a playlist of hits or songs that fall well next to each other, Infinite Worlds leads you deliberately through an almost cinematic landscape of sounds and emotions. Vagabon’s sound spans all the way from intimately acoustic confessionals and thrashing rock declarations, through to layered electronic instrumentals. All in the space of eight songs and all with great success. The fact that songs like ‘Mal á L’aise’ and ‘Alive and A Well’ were all formed from start to finish by the same individual is both perplexing and impressive. When reflecting on the importance of having autonomy over the creation of this piece of work, Lætitia explains the goal that she set for herself: to prove that she could learn a plethora of instruments, do a whole album alone, and have the satisfaction of recognising that achievement. Not only inspiring to the very artist behind it, Lætitia’s motivation behind the album has moved a host of fans internationally. Since the release of Infinite Worlds, a rhetoric has surrounded Vagabon’s emergence as a DIY frontrunner. Publications have focused heavily on stories of her migration to the States as well as the importance and responsibility she holds as one of the few black female voices within her genre. When talking about how this kind of role assignment affects her own conception of success, Lætitia elaborates that her foremost goal is to continue to improve as an artist and create better records. Like so many women of colour breaking new ground in generally white spaces, Lætitia acknowledged and complied with a kind of unspoken but strongly felt a duty to use her platform to speak about her identity and representation. And, like so many women of colour, she was met with responses attempting to use her identity to detract from her talent and her music. She began to feel that the fact that she was a black indie rock artist eclipsed the fact that she was a good indie rock artist. Making these statements of identity will always remain important for the progression of our societies and uplifting of our communities. But the shock and novelty with which many approach successful and visible women of colour, can often serve as a form of tokenism, discrediting and delegitimising their place in the spotlight, and limiting all of their actions to specific racialised narratives. This is not to say that the importance of Lætitia’s presence within the DIY scene is lost on her; in fact, the opposite is true. She is acutely aware and optimistic about the power of visibility and its effects on future potential musicians and younger generations to come. “[My hesitance to pursue music] was definitely cultural… If you don’t see it and you don’t even know about it, how can you possibly think it’s a thing when everyone around you is saying the opposite”. Through her environment, she witnessed huge black popular figures such as Rihanna, Beyoncé and Kanye West, but the DIY scene provided Lætitia with knowledge of something less fantastical and more attainable. In this same way, she emphasises the potential of these gig spaces and fostered communities to elevate people who look like her and provide them with a healing outlet and/or a possible career path. And yet, her grounding in reality leads her to admit that she knows her fans do not come to her shows to witness diatribes on race relations, or her inciting an uprising against the starkly bright white institution of Rock™. Her existence itself acts as an example of what could be for all those who – like her and many first, second, and third generation immigrants – had parents push the narrative of sidelining creativity as a plan b, and financial or job security as plan a. In fact, Lætitia completed an entire engineering degree before pursuing music as a viable full-time option. Despite Infinite Worlds being a solo project, finding this sense of community is so integral to her as an artist, and these communities take many forms both outside and inside her music. So many aspects of her experiences strike me as the most relatable content. For example: her account of being surrounded by people from all walks of life (perhaps except her own) who have been raised in artistic environments and faced little pressure to pursue a specific career; having to teach herself the validity of her passion and hoping that her presence can encourage more kids from similar cultures to do the same. When I ask if she has ever received any slightly problematic musical comparisons, she says: “I get Tracy Chapman all the time. I get Nina Simone because I’m dark-skinned with a shaved head. I get Mitski because I’m a woman of colour and I must sound like her because why would we be two separate people? !” She chuckles slightly incredulously but mostly unbothered, reeling off the list further with the likes of Angelique Kidjo – “that’s just a powerful African woman”, or Sister Rosetta Tharpe “if people want to flex their musical knowledge”. I realise that being able to laugh about a relatively personal experience that you understand deeply, with an American artist who features heavily on your very own Spotify playlists is not a routine experience for a 20-year-old black Malawian-British girl like myself; and that’s just a fraction of Vagabon’s appeal. In this day and age, our personal is political, and to be black can often be a revolutionary act in itself — particularly within the world of indie rock. What Lætitia wants you to know is that she isn’t the first to do it, and she won’t be the last. But what she does have to offer is her art — her music — and that should be taken for what it is regardless of what box she could tick off on an equal opportunities form. Her passion and determination has got her to where she is now, and when she talks about her process, her raw instinct shines through as she comments: “I’m a big believer in ‘I’ll make whatever I want to make’ and if I like it and it rings true at the time, then it’s valid and it’s usable.” And, from the promising looks of things, if she likes it and it rings true at that time, then you, me and Fred next door are probably going to love it too.